Read our report that recaps 2017 market activity and highlights the trends that will shape data center real estate in 2018. Investmentent activity in data centers surpassed all other years during 2017 at over $20 BN. 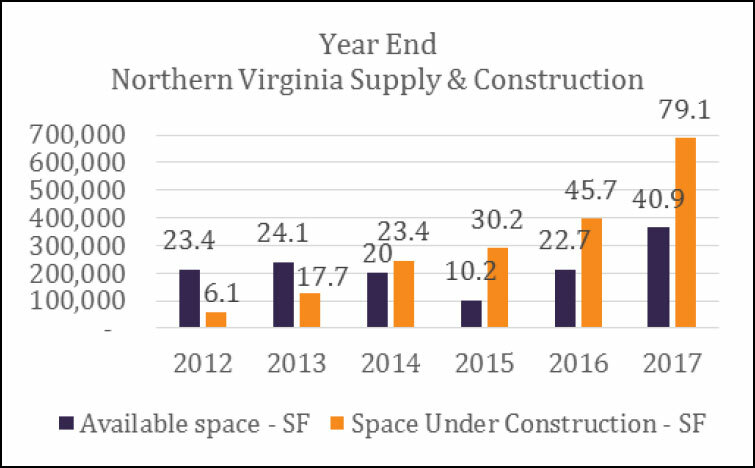 Multi Tenant Data Center (MTDC) inventory under construction is almost double of what it was 12 months ago led by Northern Virginia. Significant uptick in private equity and venture capital looking at data center investments. Overall rental rates and concessions continue to hold steady, while construction costs have declined. In addition there are significant variances between resiliency and density. While hyperscale leasing is down compared to 2016, there are several properties under contract or recently purchased by MTDC developers that leasing activity from hyperscalesmay prove to be higherthan is divulged. Facebook and Apple return to leasing large blocks of MTDC as opposed to building their own after taking several years hiatus. There are a significant number of wholesale tenants that have leases expiring in 2018 & 2019. Significant uptick of colocation companies looking to lease at MTDC properties in several markets. Assimilation of 2017 mergers & acquisitions will likely see some fall out of non-core data centers, and sale- leaseback of large corporate data centers will continue to provide shadow inventory in 2018. Amazon coupled with Google expanding outside of MTDC in several projects in Northern Virginia. Ashburn continued to dominate leasing activity during 2017. Several land acquisitions during 2017 in Loudoun County including; Google (148 acres), QTS (52 acres), Sentinel (100 acres), Vantage (42 acres), and Compass Data Centers (120 acres). Land prices in Ashburn have sold as high as $29/sf (2017) compared to Elk Grove Village at $27sf (2013) compared to Plano at $17/sf. Other sites within various submarkets may be lower. Slow down in leasing activity in Chicago in 2016 partly due to lack of inventory much of the year. 120 MW expansion of Itasca substation is expected by Mid 2018 with additional 120 MW in 2019/2020 will help spur several new developments in Suburban Chicago. Strong leasing activity in Dallas came from tenants expanding not hyperscale users and overall concern that there is a limited numberof enterprises in the market. Infomart looking to recapitalize portfolio in early 2018. QTS purchased 84 acres in Phoenix, AZ for $25 MM and EdgeConneX purchased 55 acres in Mesa, AZ. Santa Clara’s new inventory led to increased leasing led by Vantage at 13 MW after being hindered by lack of product. Several new MTDC data centers announced in Atlanta but historically there has been less than 6 MW’s of leasing activity annually. Blockchain and cryptocurrency requirements are driving new N solutions with less expensive power. In Canada, U.S. hyperscale companies, and Bitcoin continue to absorb space in Quebec, limited leasing thus far in Toronto. Significant multi-market leasing for latency sensitive requirements in MTDC led by YouTube Live. Others include Facebook Live, and POPS for hyperscale users. Expect an uptick in demand to absorb space in MTDC by Internet of Things (IOT), Artificial Intelligence (AI), and large Chinese cloud providers (Alibaba, Ten Cent, Baidu and others). Offshore capital made several investments in data center properties particularly in single tenant assets driving cap rates lower. Apple’s $1.375 BN new data center in Iowa follows major projects by Microsoft and Facebook. Facebook also building $1 BN property in Virginia.